Our longtime owner, leader, and friend fell to a horrible stroke a month ago. With no insurance and stack of bills due to his long recovery, the Phoenix music scene has pulled together in raising money for him. If you have played at Hollywood Alley or are/were a customer, then you likely know Ross. And if you know him, then you undoubtedly love him. If you care to help, here is some ways you can. We have some benefit shows coming up. 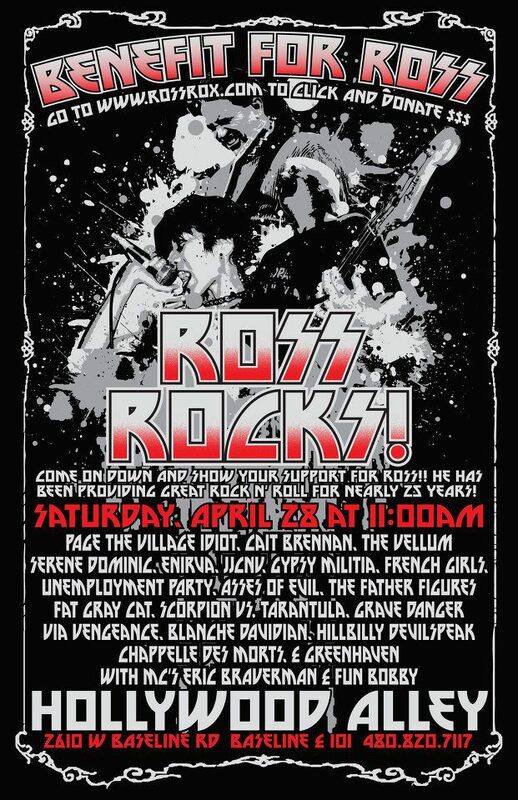 The first one is on April 28th with 19 bands (coordinated by Tom Reardon with the help of Robert "Fun Bobby" Birmingham) coming together for one cause. 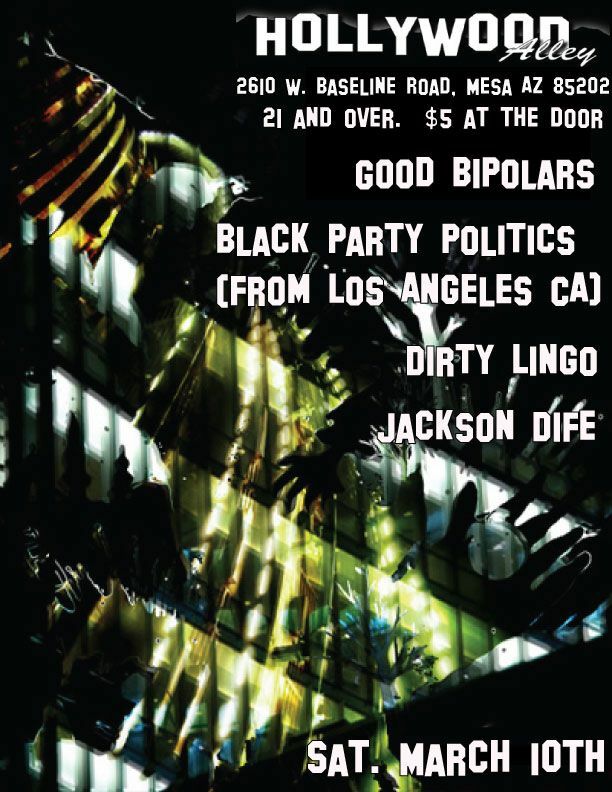 The lineup is diverse; punk, stoner rock, folk, indie rock, etc.. There will be a $10 cover plus a silent auction and other ways for people to give more. See the flyer below for more details. 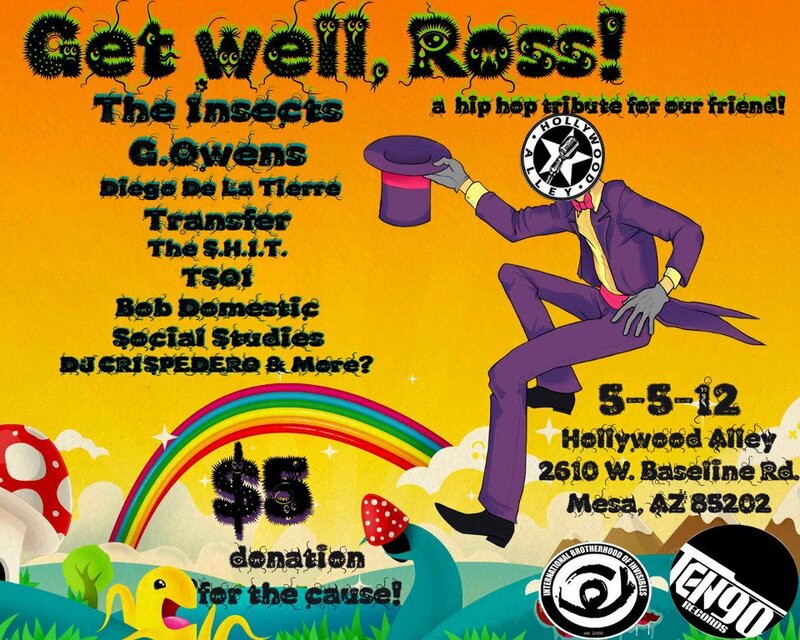 There will also be a hip-hop benefit coordinated by Brian Trujillo on May 5th. Details below. Hollywood Alley would like to thank Charles Levy, The Love Me Nots and all the bands that played Friday April 20th at The Crescent Ball Room. A portion of the door proceeds went to help Ross out as well. We would also like to thank Fred Green, Fat Gray Cat, and The Brown Tones - all who on last minute notice decided to donate all the proceeds from their already booked event at the Alley March 23rd, days after Ross was admitted to the hospital. We are so fortunate to have so many individuals and entities within the local music community here in Arizona come together and lend their time and resources in helping a primary member of our family. Thank you! $5 cover, 21+. 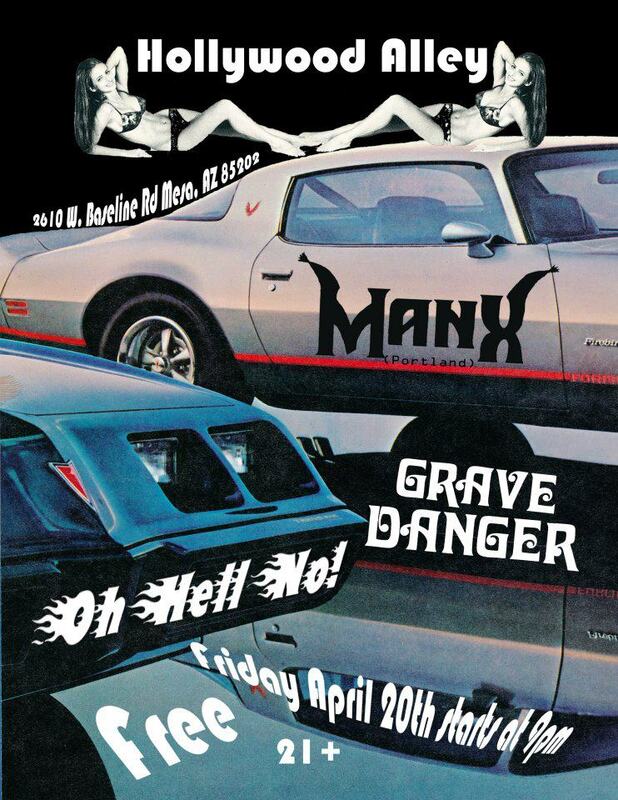 ManX (featuring Thomascyne from Burning Bush) is on tour from Portland down to AZ!!!! come groove with us! 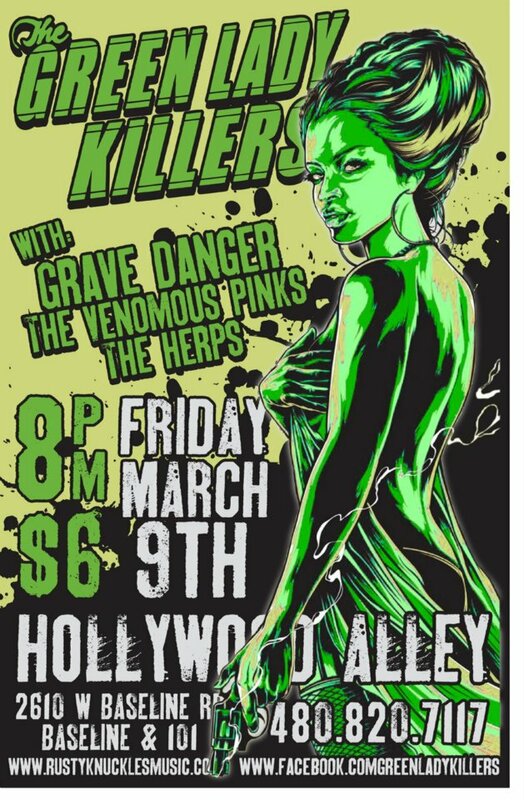 Grave Danger featured the legendary guitarist Kevin Daly and Oh Hell No! features Chuck Holder on bass/vocals/guitars! And a special appearance from none other than the talented bunch down at Contradictory records, showcasing some indie rock hitz. Rock n' roll!!!! 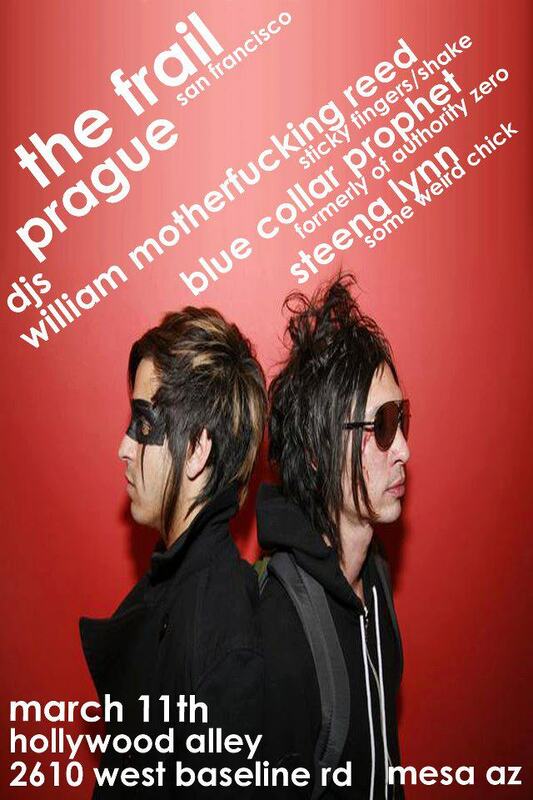 DJs (Blue Collar Profit, William Motherfucking Reed and Steena Lynn) start at 9pm and play in between and after bands. 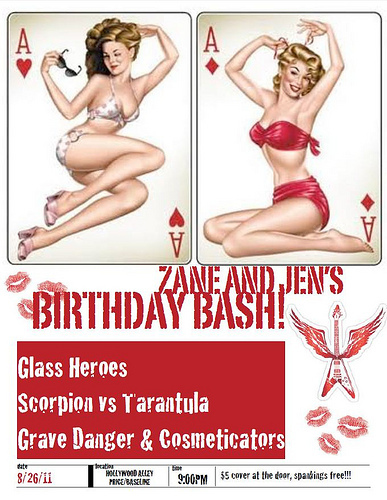 Jen and Zane's b-day party at Hollywood Alley with Glass Heroes, Scorpion Vs. Tarantula, Grave Danger, and Cosmeticators.